You will find below the horoscope of Khloe Kardashian with her interactive chart, an excerpt of her astrological portrait and her planetary dominants. Horoscopes having the same aspect Venus trine Saturn (orb 0°12'): Leonardo DiCaprio, Marine Le Pen, Halle Berry, Tina Turner, Dave Gahan, Yannick Noah, Manuel Valls, Ricky Martin, Sarah Michelle Gellar, Joan of Arc, Vivien Leigh, John Cena... Find all the celebrities having this aspect. Horoscopes having the same aspect Moon trine Ascendant (orb 0°21'): Hillary Clinton, Kanye West, Justin Timberlake, Robert De Niro, Vincent Cassel, Denzel Washington, Andy Warhol, Bruce Springsteen, George Washington, Simone de Beauvoir, Elizabeth I of England, Dustin Hoffman... Find all the celebrities having this aspect. Celebrities born the same day: Isabelle Adjani, Tobey Maguire, Ed Westwick, Lauren Jauregui, Helen Keller, Drake Bell, J. J. Abrams, Sam Claflin, San Francisco (California), Jo Frost, Dany Veríssimo, Krzysztof Kieslowski... List of all the celebrities born on June 27. Celebrities being the same height: Bill Gates, Freddie Mercury, Charlize Theron, Robert De Niro, Jean-Marie Le Pen, Jack Nicholson, Mel Gibson, Sylvester Stallone, Heidi Klum, Naomi Campbell, Melania Trump, Lucy Lawless... List of all the celebrities being 5' 9½" tall. Celebrities clicked on in real-time: 576,366,089 times. Kardashian is of Armenian (father) and Scottish and Dutch (mother) descent. Kardashian was born in Los Angeles, California to attorney Robert Kardashian and Kris Jenner (née Houghton). Robert Kardashian died on September 30, 2003. Her mother, Kris, divorced Robert in 1989 and married Olympian Bruce Jenner in 1991. Here are some character traits from Khloe Kardashian's birth chart. This description is far from being comprehensive but it can shed light on his/her personality, which is still interesting for professional astrologers or astrology lovers. 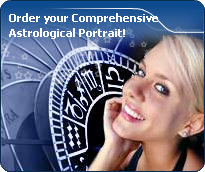 In a matter of minutes, you can get at your email address your astrological portrait (approximately 32 pages), a much more comprehensive report than this portrait of Khloe Kardashian. Khloe Kardashian, the nocturnal North-western quadrant, consisting of the 4th, 5th and 6th houses, prevails in your chart: this sector favours creativity, conception and some sort of specialization or training, with helpfulness and relations as strong components. You need others' cooperation in order to work properly, although you are not very expansive: creating, innovating and thinking are what matter most to you because this self-expression enriches you and totally satisfies you. The predominance of Water signs indicates high sensitivity and elevation through feelings, Khloe Kardashian. Your heart and your emotions are your driving forces, and you can't do anything on Earth if you don't feel a strong affective charge (as a matter of fact, the word "feeling" is essential in your psychology). You need to love in order to understand, and to feel in order to take action, to the detriment of a certain vulnerability against which you should learn to fight. Cheers for communication and mobility, Khloe Kardashian! The predominance of Air signs in your chart favours and amplifies your taste for relations and for all kinds of short trips, whether real (travels) or symbolic (new ideas, mind speculations). You gain in flexibility and adaptability what you lose in self-assertion or in pragmatism. Earth qualities are under-represented in your chart, with only 7.12% instead of the average 25%. Deficiency in Earth may indicate that you have no interest in material and concrete values. It is likely that you live too much in your heart or in your mind, or even in your enthusiasm! The fact remains that you may end up in tricky situations, due to your lack of good sense or forethought: material life is unavoidable even if you are rather idealistic, dreamy, or easily content. You must tackle concrete life necessities, for fear of... being forced to cope with them, later, in much more unpleasant ways! Khloe Kardashian, the Cardinal mode is dominant here and indicates a predisposition to action, and more exactly, to impulsion and to undertake: you are very keen to implement the plans you have in mind, to get things going and to create them. This is the most important aspect that inspires enthusiasm and adrenalin in you, without which you can grow weary rapidly. You are individualistic (maybe too much?) and assertive. You let others strengthen and improve the constructions which you built with fervour. The emphasis is on succedent houses in your chart, namely, the 2nd, 5th, 8th and 11th houses, Khloe Kardashian: this configuration usually endows a personality with affective and sensitive qualities. Obviously, to the detriment of self-confidence or self-assertion, but your heart qualities may be very important. These houses also favour realization. Time and patience are part of their characteristics. However, they are only indications and you must include them in the rest of your chart in order to see whether they are validated or not! After this paragraph about dominant planets, of Khloe Kardashian, here are the character traits that you must read more carefully than the previous texts since they are very specific: the texts about dominant planets only give background information about the personality and remain quite general: they emphasize or, on the contrary, mitigate different particularities or facets of a personality. A human being is a complex whole and only bodies of texts can attempt to successfully figure out all the finer points. Your intelligence is sensitive and delicate, with good comprehension abilities, Khloe Kardashian, which endows you with a strong intuition and receptivity. To you, impressions and feelings prevail over facts and your excellent selective memory is not cluttered with useless elements. Although you are not aware, your fertile imagination may lead you to change your daily reality so that it matches your dreams better. If you are creative, you may make use of your imagination in literary pursuits where you can freely invent beautiful stories taking place in the past. Your passion for History is such that you may immerse yourself into it with too much nostalgia and therefore, you may miss opportunities the present offers to design projects and to think of the future. You are sensitive, vulnerable and tender at the same time, Khloe Kardashian. When you love, you give your entire affection and your partner may in all confidence rely on a long-lasting and reassuring relationship. You are so calm and so tender that you think that it is enough to win over your partner's heart, and you are often right. However, do not mix up giving and receiving. You so deeply need to receive love in return that you may be too passive and in the long run, as you become demanding, you may show immaturity. Security and sustainability in your relationship are of utmost importance. Your family also is important, it is the refuge, even the sanctuary, where you like you hide when things go awry. You also dream of love, may be too much, and it may be detrimental to what might be concretely experienced if you were more dynamic or less fearful to get hurt. However, remember that you receive only as much as you give. The ruler of the Ascendant, Khloe Kardashian, is Uranus. It is posited in the sign of Sagittarius and gives you a strong inclination for the open sea and for freedom. Loyal and benevolent, you put things into perspective, and you understand the true value of things, perhaps precisely because you travel - whether actually or mentally - and that stepping back from your intimate environment enables you to better perceive what is important and worthy. Your iron will is part of your assets, Khloe Kardashian. It is supported by an ingenuity and a skilfulness that may turn you into a mighty and feared personality. You have the knack of spotting weaknesses in persons you deal with and you can easily hurt them with your innate propensity to drill or to test their force. You are extremely stubborn and you never let go when you are convinced that you are right. Sexually, you are potent and passionate. You are domineering and secretive, with a magnetic personality. It is safer to avoid being taken in a conflict with you because you may be very aggressive and you bear grudges. In some cases, you may also be sadistic. Your personality is as secretive as it is domineering in the areas of action and sexuality. This text is only an excerpt from of Khloe Kardashian's portrait. We hope that it will arouse your curiosity, and that it will prompt you to deepen your knowledge of astrology, as well as to visit and use the wide range of free applications at www.astrotheme.com. Your Life Path is influenced by the number 1, Khloe, which often prompts you to have an active and sometimes original life. 1 is the number of creativity and indicates individual destinies which are achieved at the cost of personal efforts because, although the path may lead very far, it climbs steeply upwards. You need to learn to manage your life with a strong willpower while using your own resources. It is most likely that you reach the best of your possibilities if you choose a free-lance occupation, or anything which allows a lot of personal initiatives. You really need freedom of action. You prefer to innovate rather than to follow the trend, and to create rather than limiting your activities to repetitive tasks. Thus, your life may be theatre of spectacular twists and turns, all the more so because the more you progress, the more your indecisiveness fades away. In such conditions, it is necessary that you strive to maintain a minimal degree of stability in the course of your life.